August 17, 2015 August 17, 2015 by Beau H.
More than 100 years and still going strong — excellent heritage hatmaker Goorin Brothers. Editor’s note: For more brand profiles covering the world of men’s grooming, accessories and apparel, click here. Like lots of things in the men’s style world, hats can actually be pretty divisive. I mean, it’s just a hat, right? Wrong. Ballcaps strike some as too casual or college-esque, while traditional hat styles – like bowlers or wide-brimmed fedoras – also draw ire. So some folks simply won’t get on board. It seems on the one hand though that throwing on a statement hat is something lots of menswear bloggers have turned to in the past few years as part of the burgeoning street style trend. That’s had a slow trickle-down effect into the rest of the population, to the benefit of heritage brands who’ve produced traditional styles for decades. Heck, just look at any postgame sports press conference and you’re likely to find a hat or two – whether well-done or not. 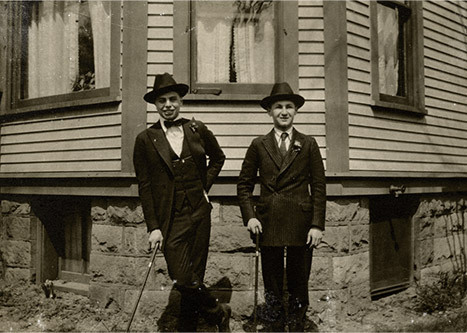 More than a century’s worth of experience in the biz — Alfred and Ted Goorin took over the business from father Cassel, hence the name you see today. Photo courtesy of Goorin Brothers. For those looking to get into the hat game without too much pretention or fanfare, Goorin Brothers is an excellent option. They’ve harnessed their collective years of experience into producing of-the-moment hats that still nod to traditional styles and construction methods, much like their significantly younger and more casual contemporaries at Ebbets Field Flannels, among others. And they’ve done so in a way that’s rooted in quality and attention to detail. When you do one thing so well, that’s likely to draw attention – in a good way. The business has been passed down through the family for more than a century, something that it seems happens less and less these days (to put it mildly). The styles and shapes have expanded across the years, but that same attention to quality remains — with a modern update. The brand is bringing back the idea of the neighborhood hat shop, too — they’ve got 36 shops across the country and counting (including four in NYC alone). An crisp-casual way to wear a vintage ball cap. Unconstructed blazer by J. Crew. Heathered burgundy pocket tee by Steven Alan. Slim khaki chinos by Taylor Stitch. Chukka boots by Timberland. Glasses by Warby Parker. Classic Bristol leather watch by Daniel Wellington. The brand’s expertise extends across nearly every style imaginable, from ball caps and flatcaps to those aforementioned bowlers and tophats. I had the chance to work with the brand to test-drive one of its vintage ballcaps — the No. 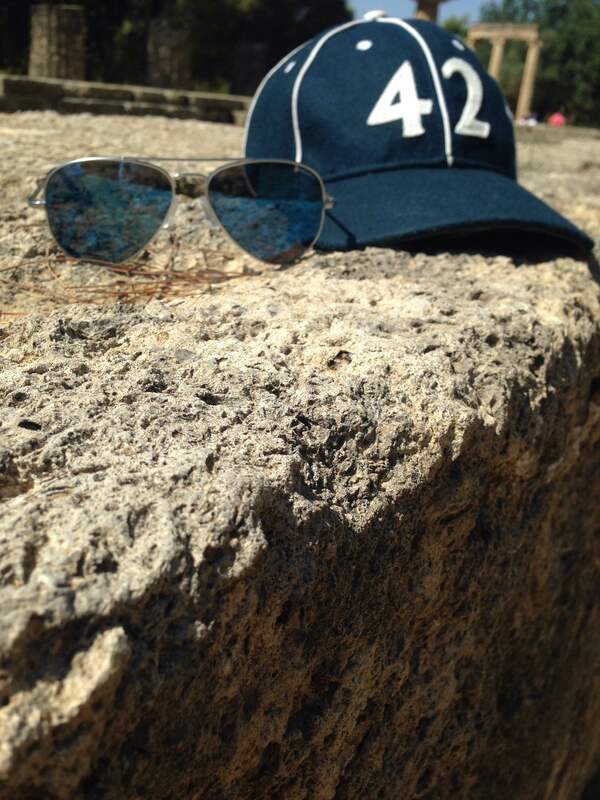 42 ball cap seen here — during a trip to Michigan in late July, followed by a jetsetting trek to Greece thereafter. If you’re going to give a ball cap another try, this is the sort of hat you should reach for. Unlike sports or performance logo-heavy ball caps, which look too sporty to wear with even crisp-casual apparel (like slim khaki shorts and a polo), a Goorin Brothers cap fits right in just fine. (Of course, if you’re an avid golfer or sports nut going to a game, might still be best to reach for one of those). But this vintage-style cap in particular is one you can test-drive with sporty-casual outfits or with a short-sleeve shirt and chinos. The No. 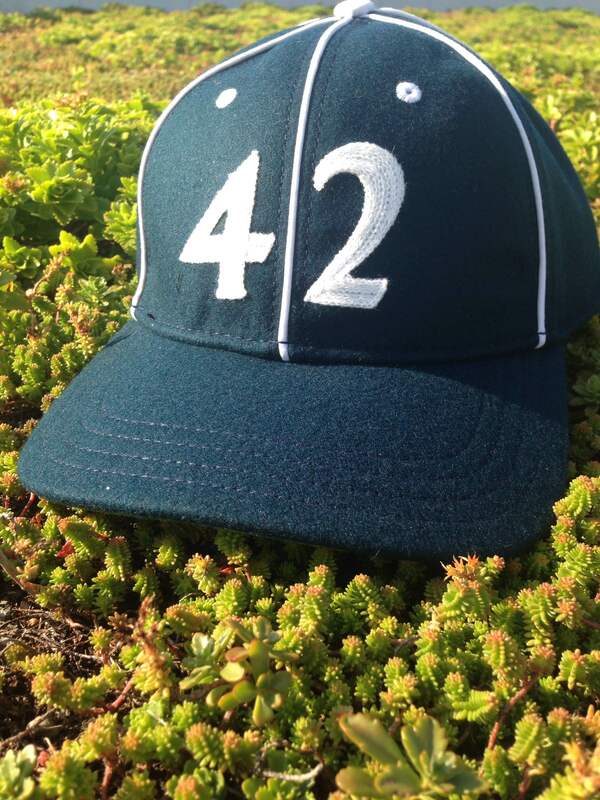 42 ball cap from Goorin Brothers. –a standout hat style with vintage details makes for a crisp complement to all kinds of outfits. The lack of notable branding or logo placement on Goorin’s hats in general is a huge plus – the brand’s ball caps in particular have an old-school appeal that’s difficult to find in your average sporting goods store. That makes them look cool and complementary, rather than detracting from a polished look (i.e. 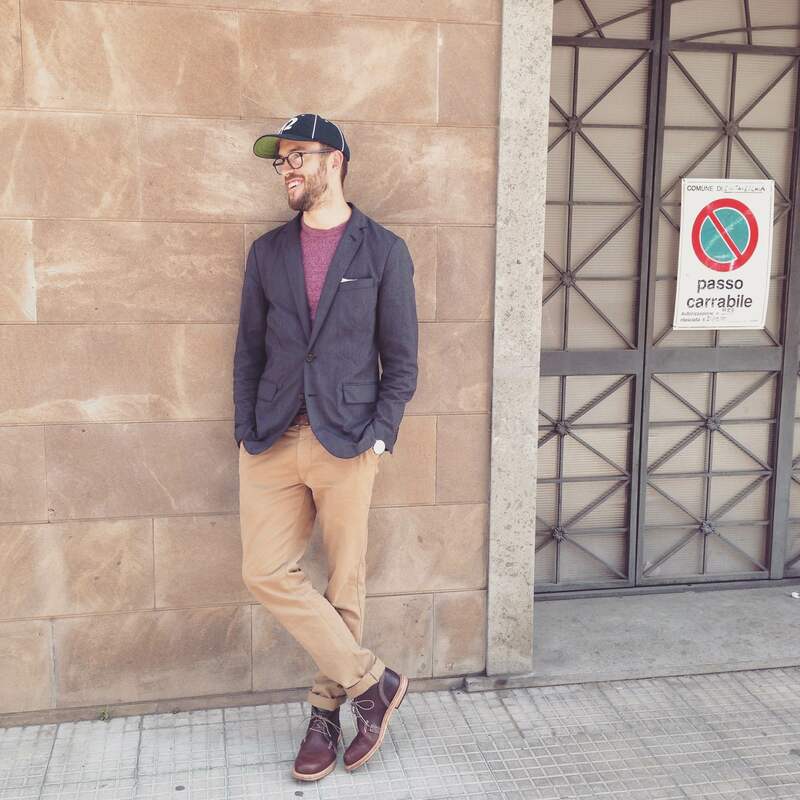 the blazer-T-shirt-chinos ensemble seen in these photos). For those seeking a more standout cap, Goorin’s other retro hats, inspired by old military-branded hats, offer an alternative. Those might look more fitting at a fun barbeque or tailgate this fall. A crisp hat like the one seen here from the brand is easily wearable in sportier situations, too. Sweatshorts by Pistol Lake. Pocket tee by American Apparel. Slim Mailbag by Satchel & Page. Sneakers by Athletic Propulsion Labs. Sunglasses by Randolph Engineering. Partial photobomb by a fellow tourist in Greece. And particularly when it gets chilly, an eyecatching hat in a cold-weather fabric certainly has its appeal, as does a warm-weather Panama hat. On that note, Dan from Articles of Style nails these sorts of looks. Now, a cold-weather hat does lack that crucial ear coverage in a snowstorm, to be sure. 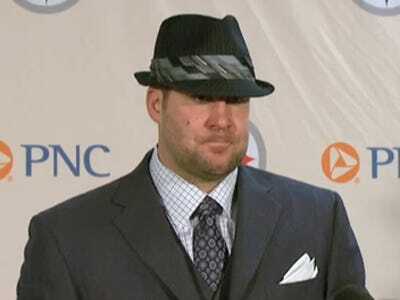 But, the combination of an old-school hat plus some tailored wear does look pretty darn sharp. 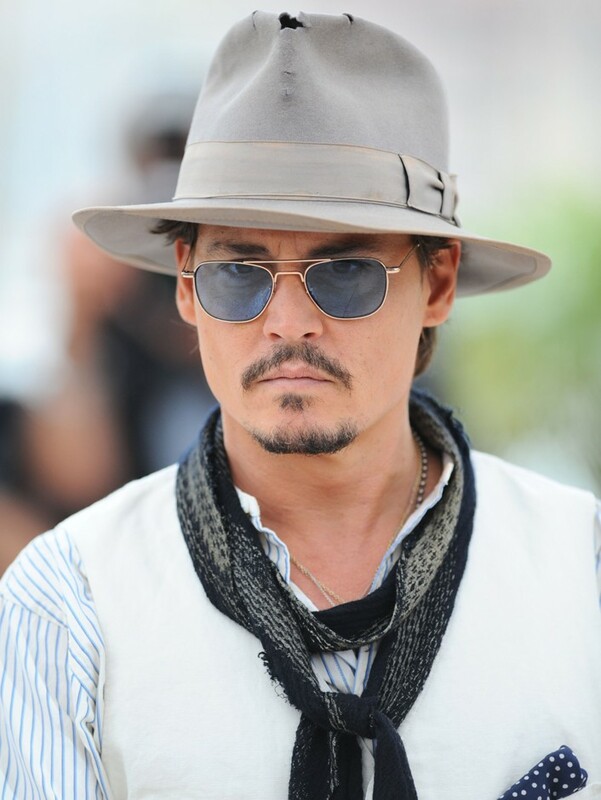 Decades past certainly nailed that style, but it’s one that’s largely fallen out of favor or has been done mostly “wrong” in recent years (sorry, Johnny Depp). Now though, it’s poised to make a nice resurgence thanks to the lack of ostentation or “look-at-me” flair from Goorin Brothers – these are hats that are well-made and mesh with a variety of looks. The lack of ostentatious details makes it easy to pair a vintage ball cap with classic Aviator shades — like these ones from Randolph Engineering. Goorin’s pricing meets the needs of those looking to dip their toes into the world of hats, as well. Ball caps come in at under $40, namely. The brand’s “dressier” or more traditional hats do range in from price from about $70 to $200 though — making this the sort of splurge purchase that you’d have to wear a lot to justify. 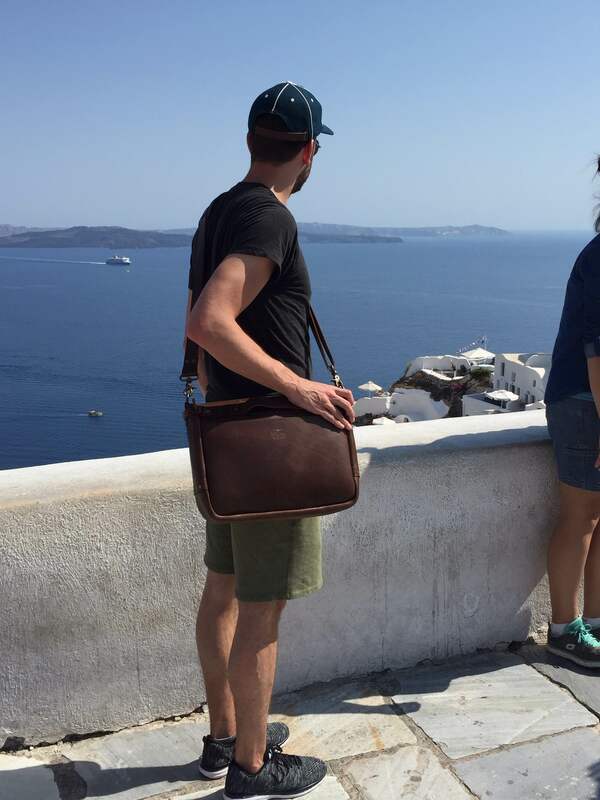 However, I’ve found my ballcap to be comfortable, breathable and wearable in the heat from Michigan to NYC to Greece – and it should work just as well in the fall and winter months. Ultimately, a hat of any sort is going to be the type of accessory that might break an outfit – but it can also make an outfit if worn in the right setting, at the right time and with the right accessories. Again, this is all subjective though – so if the hat fits (and you like it)… wear it! Are you on-board the ballcap bandwagon? Do you own or have you considered any of the aforementioned hat styles?